Q. How do we ensure minimal interruptions to CPR? Q. Why do we need to measure ETCO2? Q. What are the key elements of coordination and teamwork? Q. What are the key non-technical factors important for good teamwork? Q. What are the key elements of Continuous Quality Assurance which need to follow each OHCA? Beyond performing high quality CCCs at the correct rate there are a range of tasks which also need to be performed during the resuscitation. These are listed below and are divided broadly into those which can be performed WITHOUT interrupting CCCs and those where some interruption is necessary. Where CCCs must be interrupted this must be for the shortest possible time. The team leader plays the key role in the conducting the “orchestra” of CPR to ensure minimal interruptions. An example of a useful strategy is to change rescuers or change to mechanical CPR during rhythm analysis/pulse check. Newer technologies such as mechanical CPR devices can dramatically improve CPR fraction particularly during extrication and transport phases. Ventilation can be performed between mechanical compressions and unlike humans mechanical CPR machines never get tired (at least while their battery is charged). The previous section referred to the central role of the Team Leader in Q-CPR. The concept of the Formula 1 Pit Crew- the “Pit Crew” Model of resuscitation is been mooted as an example for teams carrying out cardiac arrest resuscitation. It is certainly a powerful meme which has been used by EMS systems around the world to improve their performance. Here is an example of a Formula One pitstop. The ideal represented by Formula 1 of a large team where each member has only a single simple job to do exactly the same way each time as rapidly as possible may be the way to pitstop a Formula 1 car but is certainly at odds with the reality of resuscitation in the real world. The challenge for clinicians particularly prehospital is to work with ad hoc teams in non-ideal circumstances often moving between roles day to day and even minute to minute. What is missing in the standard Racing Pitstop is the centrality of the Team Leader role. Each individual at a pitstop has their equipment ready and already knows their job so doesn’t need direction or oversight. There are very limited options to deviate from the standard response and if it goes wrong it is rarely possible to change course quickly. It cannot be overemphasised how important the role of the Team Leader is in our world. A good Team Leader has the potential to turn the ad hoc team into a high performance team provided they have a clear understanding of the path to success and they have the crew resource management skills to make it happen. It is less important how experienced the Team Leader is than their understanding of what needs to be done and their non-technical skills in achieving those aims. Ideally a Team Leader remains relatively hands-off to facilitate situational awareness but in a 2-person team they must clearly be involved in the direct patient care. When back-up arrives new staff can be utilised to free up the Team Leader. Q. Why to we want to measure ETCO2 in cardiac arrest? Quantitative waveform capnography is the continuous, noninvasive measurement and graphical display of end-tidal carbon dioxide (ETCO2). The inhaled and exhaled carbon dioxide is detected and graphically displayed as a waveform on the monitor along with its corresponding numerical measurement. 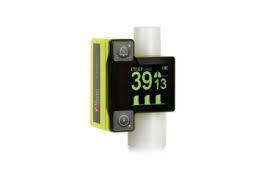 The EMMA Waveform Capnography device is a great adjunct to CPR. If the tracheal tube or LMA is in a good position ETCO2 will be detected EVEN in cardiac arrest. The number may be low and the waveform abnormally flat but it will be detectable. Failure to measure any ETCO2 should point immediately to a misplaced airway or an equipment fault. Colourimetric devices like the EasiCap are NOT sensitive enough in cardiac arrest and are unreliable. ETCO2 is directly affected by cardiac output and so is very useful in evaluating effectiveness of CCCs. Measurement of a low ETCO2 value (< 10 mmHg) during CPR in an intubated patient would indicate that the quality of chest compressions needs improvement. ETCO2 is a function of cardiac output as it depends on Co2 being transported around the body from the tissues to the lungs. A sharply rising ETCO2 can be a sign of ROSC as cardiac output has improved with intrinsic cardiac activity. A detectable pulse would be expected on the next scheduled pulse check but if not present and no other signs of life are present then CCCs should resume. 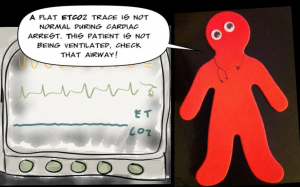 ETCO2 can also be useful in deciding when to persist with resuscitation and when to “call it”. Prolonged low ETCO2 (<10mmHg) after 20min of CPR correlates with futility of therapy and consideration should be given to ceasing resuscitation. High ETCO2 (>20mmHg) is associated with a higher chance of successful resuscitation and should prompt consideration of continuing resuscitation attempts. ETCO2 becomes much less useful for prognostication or prediction of ROSC when mechanical CPR has been established as the ETCO2 will often be high due to improved cardiac output from CPR. The more acute the situation, the more a directive, commanding approach is required as opposed to a collaborative, consulting type of leadership. 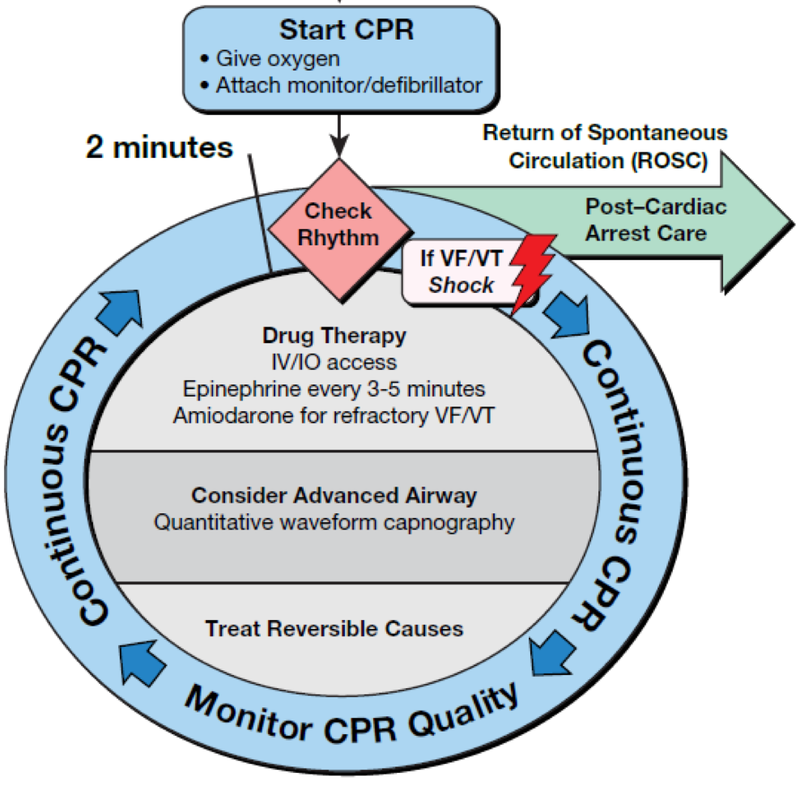 Example: “We have optimised basic life support with mechanical CPR and ventilation. At the next rhythm check I will ultrasound to rule out an obstructive cause and then we prepare to move the patient”. Allocating tasks to the most appropriate individuals eg. Apply mechanical CPR device early to free up staff to manage airway and vascular access. Vigilant monitoring of patient, awareness of hazards such as sharps and electricity, and sensitivity to any unexpected changes in the clinical situation. How are we going to get the patient out of here? Ability to attend, remember, and make decisions when under stress. This is achievable through simulation, learning and clear understanding of protocols and skill sheets, looking out for teammates, and paying attention to your physical needs (rested, full stomach, empty bladder, well hydrated).